“Fresh, sophisticated and classy” were the words Melbourne Convention and Exhibition Centre CEO, Peter King, used to describe the 20,000 square metre extension to the centre when it opened at an MCEC Expansion Industry Launch event yesterday. Taking its design cues and theme from a prosperous time in Victoria’s history – the Gold Rush period of the 1850s – 1860s, the centre now boasts the largest meeting and convention space in Australia, with a total size in excess of 70,000 square metres. 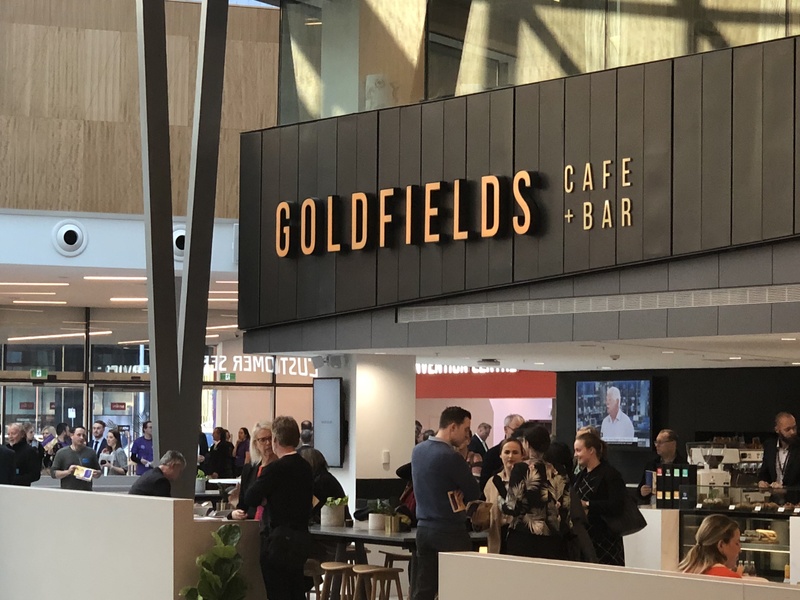 New additions to the event space include exhibition halls, additional meeting rooms and banqueting space, plus the aptly named Goldfields Café and Bar. Mr King reinforced the importance of continued evolution of this facility, to maintain Victoria’s prominent position as a preeminent force in the delivery of world class meetings and events that connect and inspire attendees. He also announced an exclusive partnership with C2, an organisation that brings together commerce and creativity “to explore trends, opportunities, disruptions and major shifts on the horizon.” This partnership will encourage MCEC to ‘deliver events differently,’ when developing a series of “innovative, engaging and interactive” experiences, that will stimulate attendees to expand the way they would traditionally address business opportunities and challenges. The Centre extension has been designed in such a way to place the guest experience and ease of their transition from one space to another at its core. It also intends to provide visitors to our state with a sense of “Melbourneness” when showcasing themes, experiences and design culture that is quintessentially Melbourne! The new event space recently opened for business and has already hosted 1,000 key stakeholders and leading authorities on addressing and treating malaria.